This article is about an item in the Mario & Luigi series. For the FP recovery item in Super Mario RPG: Legend of the Seven Stars and the Paper Mario series, see Honey Syrup. For the recurring character in the Wario Land series, see Captain Syrup. Syrup Jars are consumables that appear in the Mario & Luigi series as one of the main items in the games. When consumed, they restore a certain amount of Bros. Points to their consumer. They are usable both during and outside of a battle, and have the ability to heal special stats that allow the use of special moves. Supersyrup Jars, Ultrasyrup Jars, and Max Syrup Jars each successively heal greater amounts. 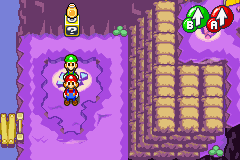 In Mario & Luigi: Superstar Saga, Syrup Jars (referred to as Syrups) recover twenty Bros. Points to its user. They are sold at the Castle Town Item Shop and the Little Fungitown Item Shop from the first visit for twenty-four coins. Several enemies have a chance of dropping them after a battle: Queen Bean has a 100% if her left arm is deflated, non-flattened Rexes have a 32.26% chance, Spiky Snifits have a 25.81% chance, Chucklehuck Woods' Chuck Guys have a 22.58% chance, and Yo Bros. have a 9.68% chance. In Mario & Luigi: Superstar Saga + Bowser's Minions, Syrup Jars heal fifteen Bros. Points instead of twenty. In Mario & Luigi: Bowser's Inside Story, Syrups return after being absent from Mario & Luigi: Partners in Time. They recover ten Special Points (the equivalent of Superstar Saga's Bros Points) when used. Goombules, Elite Goombules, Protobatters, and Sneeds have a 30% chance of dropping a Syrup Jar after fighting them, Treevils have a 25% chance, Beehosses, Flifits, and Spike Blops have a 20% chance, Trashures have a 15% chance, Chain Chawfuls have a 10% chance, and Biffiduses have a 5% chance. In Mario & Luigi: Bowser's Inside Story + Bowser Jr.'s Journey, Bowser uses cheese to restore his SP instead of Syrup Jars. In Mario & Luigi: Dream Team, Syrup Jars are back to restoring Bros. Points and again restore twenty of them. They can be bought from item shops at the beginning for twenty coins. Dreamcap Captains and Flibbees have a 10% chance of dropping a Syrup Jar. Syrup Jars return in Mario & Luigi: Paper Jam. This time, Syrup Jars can also be used to recover Paper Mario's BP to use Trio Attacks. This page was last edited on March 25, 2019, at 09:27.